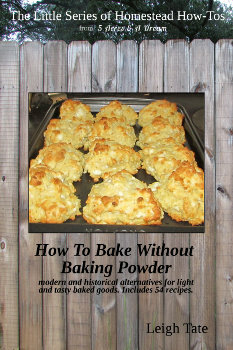 I'm pleased to announce that How To Bake Without Baking Powder is now available in paperback! 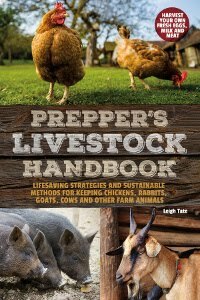 I'm calling it my prepper edition, because if SHTF or TEOTWAWKI, then Kindles and other eReaders won't be as useful as they are in a world filled with electricity. Call it a personal preference, but when it comes to information I want to hang on to, I much prefer owning a hard copy than having to rely on an electronic device. And this book contains the kind of information you need in a hard times, emergency, or survival situation. I have expanded it to include my hardwood ash baking experiments plus a discussion about the different kinds of lye, lye water, and how they differ from ash water. It has been formatted for twelve charts and an extensive index (two things eBooks cannot do). You can see the chapter and chart titles here. Paper copy books allow for the use of tables to make charts. Electronic books cannot, and so charts must be line items. Both versions still include 54 modern and historical recipes for 20 different leaveners. In the print book I've added several pages for you to write in your own recipes. For the eBook, I've reformatted the recipes to display one recipe per screen. I think that will make them easier to follow. If you already have the eBook you can get the updated version for free. If you bought it from Amazon, you should automatically get the update via its Whispernet. For Smashwords, once you've paid for it, you can download any new versions for free. BUT, I'm giving away one free copy of the new paperback version of How To Bake Without Baking Powder, plus 6 free eBooks from The Little Series of Homestead How-Tos. Each winner of an eBook will receive a coupon code to download the eBook of their choice for free at Smashwords. That includes the three new eBooks I've written since my last giveaway. Chapters: Why Grow Ginger?, How To Select Rhizomes, How To Plant, How To Keep Your Ginger Happy, How To Harvest, How To Store, To Peel or Not To Peel?, How To Keep a Continual Supply, Pests and Diseases, How To Make Crystallized Ginger, How To Dehydrate, How To Make Powder, How To Lacto-ferment, How To Make a Ginger Bug, and Medicinal Uses. 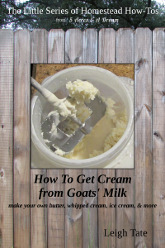 Includes: Natural homogenization, how to check goat milk for cream, how to collect (hand skimming, cream separators), how to make butter (making, washing, salting, preserving, salting, clarifying, making ghee, French butter keepers), how to make whipped cream, sour cream, crème fraîche, and ice cream. Includes 8 recipes. Chapters: What's Up with Whitewash?, All About Lime, Safety Precautions, Basic Whitewash Recipe, How To Make Your Whitewash More Durable, How To Make Your Whitewash More Waterproof, How To Color Your Whitewash, Care And Maintenance Of Whitewash. 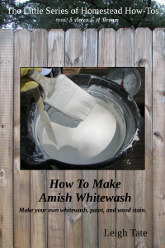 Includes a collection of homemade whitewash, paint, and stain recipes. To enter, simply leave a comment. If you help me promote my giveaway (or the new paperback version of How To Bake Without Baking Powder), I'll give you two extra entries per shout out. If you do a blog write-up, I'll give you three extra entries. This giveaway is open to anyone in the world. Each winner will receive one book, so there will be a total of 7 winners. Coupon codes will be sent to you by email, after you've contacted or replied to me. I'll be back on Sunday, August 14 to announce the winners. In the meantime, I'm going to spend the week doing some much needed computer updates. I love a good giveaway but i'd rather that it went to someone more deserving, ie someone who actually bakes!!! You are such a clever girl and clearly love to share. Do you ever do nothing? I"m with Lynda D. I'm not a baker per se, but here's hoping you get a slew of comments and orders for your new book! 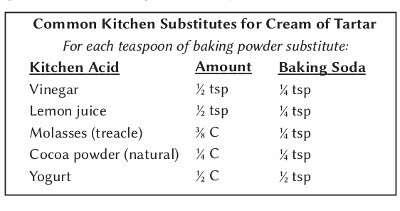 I'm fascinated by the idea of baking without baking powder! Your ability to experiment and keep good notes is quite impressive. I tend to forget to write down my steps along the way and then can't recreate what I just did! I read your site every day - love your integrity. So many good books and I have to admit hard copy is my preferred source. I used whitewash in my calving barn....a fresh coat before each season, I think it helps with disease and cleanliness in a barn. I prefer hard copies of my books. I would love to win. I am always being asked to review e-books and I tell them, "no, I only do "real" books". Most of them tell me they didn't know anyone ever read them. I guess I am a dying breed. I'm on the Ubuntu forum where I've heard it declared that print books are dead. Ha! eBooks are okay for fiction, but for nonfiction they are a poor choice. I hope from the comments that you realize you are not alone! Fiona, I agree about whitewash. It is too alkaline for many insects so it really helps keeping insect populations down. And nothing feels cleaner than pristine white. Lime based whitewash is still used in Cattle barns here. It is supposed to keep insects at bay, and keep the animals free from disease.... But I expect you knew all that. I think this will be a great book!!! 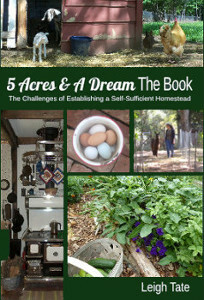 I recently discovered your blog, and am excited to check out your books as I start my own homesteading adventure! Well, this sounds very interesting, actually, several of the books cover some exact things I have been wondering about. Making butter from goat's milk,... now I wanna see that! And, I have a ginger plant started in the greenhouse right now. Glad I found your site ! Great info. Would love a book ! Hi Leigh! Anna Hess sent me over. What a great give-away! Count me in!!! Thanks for doing the homework that makes our lives a little bit easier! I'm always glad to hear how these time-honored techniques are still in use. They ought not to be lost to the world. Where do you find the time Leigh? I agree hard copies of recipe and how-to books are so much more useful than e-copies. Good luck, hope they sell well. Would love a chance to win one of your books. Shared on our blog, the Fast-SoS FB page, the Wyrdwood FB page and my own FB page. Sounds like a useful book. I keep hard copies of the survival oriented books I would want to have on hand in a blow up. I also keep them on my Kindle, both on the device and in the cloud. The Kindle is easier to read, and I could charge it using my little solar panel rig, but then, as you point out, only what was stored on the device would be available if the net went. Wow! These all look like fun! Thank you. This book sounds extremely useful as well as the other books too... I love living the country life!! Great job! I would love to win! Being in the UK I don't expect to be "put in the hat" for the book. But I think I will buy it anyway as it fills a gap in my knowledge. I had no idea that molasses could be used as a leavening agent with baking soda! So much excellent information. 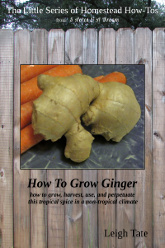 I purchased your book (e-format) on growing ginger and found it very well written and stuffed full of information. I'm thinking I need to add the whitewash book and the cooking with wood ash book to my library as well. Winning a copy of any (except the ginger of course) would be lovely. Gill, I'll include your name anyway. :) In any event, all of my books are available at Amazon UK (or Amazon DE, FR, IT, or ES. Also Amazon CA, MX, IN, JP, and BR). Oh yes and it works very well. There are actually many foods that work with baking soda, and it was fun learning about them and experimenting. I confess, however, that I use the eyeball method of measuring. These combinations are very forgiving and produce good results without exact measurement. What a great deal of information! I was at a program last night where the speaker suggested TSWHTF in September because the world financial condition is fragile. Of course, our news doesn't show such information. So, I think it is wise to be prepared! You certainly have made a great deal of information available to us newbies. Thanks! I'd live to be in the competition for this. I might even have to do a blog post as well as I love for you to do well with your writing! Always nice to see your giveaways Leigh, count me in please and thanks. Katy, good to hear from you! Hopefully there will never be a need for prepping, but having been jobless more than once, I know how important it really is. A medical preparedness class sounds wonderful! Would have liked to take that myself. No, the typical news outlets aren't going to talk about that stuff at all. Of course, they seem to have shifted from giving information to some sort of "social responsibility" to keep things going in a certain direction. Bad news might cause a panic! Interesting about the prediction for September. It's really amazing the system has stayed afloat as long as it has. Kev, I'd very much appreciate that! As I've been adopted into a couple of post-zombie-apocalypse teams, I'd better know my stuff for when the SHTF! I also posted a link to this page on my FB page. I know how much work goes into creating an ebook - thanks for compiling all this information together for us! Wow, then you ought to be the ones writing the books! I've only been working with goats for about 8 years, and I know I have a lot to learn. I've wanted to make return visits to your blog, but it appears you haven't blogged in awhile. I could probably learn a lot from you. Leigh you are inspiring! Yes I am guilty of blog neglect but I have a good excuse er reason. I would be happy to contact you by email if you want to ask away. I know I will learn a lot from you as I already have on all topics. Not quite sure how to share email addy without sharing with the whole world. I am a vet tech but am not computer tech one bit lol! ps just found your addy . smarter than I thought! Thanks for the generosity of offering us this book either as a gift (doublé gift) or as a wise purchase.